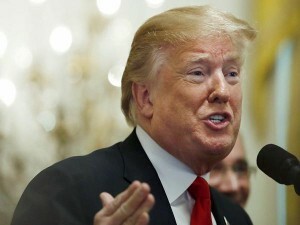 US President Donald Trump said Wednesday he hoped to meet again early next year with North Korean leader Kim Jong Un but insisted he was in “no rush” after top-level preparatory talks were abruptly postponed. Secretary of State Mike Pompeo had been set to meet a top North Korean official on Thursday in New York to prepare a second summit and work on a potentially landmark deal on ending the totalitarian state’s nuclear programme. But North Korea has stepped up its demands for an easing of US sanctions and the State Department, without offering a reason, said late Tuesday that Pompeo’s meeting was off. Trump, in a free-wheeling news conference after midterm elections, said he was willing eventually to ease the pressure on North Korea. US President Donald Trump (AP). Trump played down the delay in Pompeo’s meeting with Kim Yong Chol, a right-hand man of North Korea’s leader, and said it was a scheduling issue. “We will make it another day. But we are very happy how it is going with North Korea,” Trump said. “But I will say this, I will say this very simplyWe are in no rush, the sanctions are on,” he said. North Korea has demanded that the United States end its tough economic sanctions now that it is negotiating with Trump over its nuclear programme. State-run media, in a statement last week, warned that North Korea was “seriously” considering a return to a guiding policy of building nuclear weapons and said that sanctions were “incompatible” with improving relations with Washington. But the Trump administration says that sanctions must remain as pressure until a final accord, rejecting an incremental approach favoured by ally South Korea as well as calls to end sanctions by China and Russia. Trump met in June in Singapore with Kim in the first-ever summit between the two countries that never formally ended the 1950-53 Korean War. Trump has cast his diplomacy with the elusive thirtysomething leader as evidence of his masterful deal-making. Just a year ago, he was threatening “fire and fury” against North Korea. At the news conference, Trump pointed out that North Korea has not tested further missiles amid the talks. “We made more progress in that four or five months (since the summit) than they have made in 70 years,” he said, referring to previous US leaders. “And nobody else could have done what I have done,” he said. His insistence on being in “no rush”which he repeated five times in different formulationsmay be a response to criticism that North Korea has not moved quickly enough since the summit. Many North Korea watchers doubt that the regime will ever truly give up nuclear weapons, to which three generations of the Kim dynasty have generously devoted the country’s scarce resources. North Koreaconsidered by human rights groups to be one of the most oppressive regimes in the worldhas for years sought formal US recognition as a way to guarantee the regime’s survival. Former president Barack Obama, who generally welcomed chances to improve relations with US adversaries, was skeptical of North Korea and pursued a policy of “strategic patience”effectively deciding to wait indefinitely so long as the regime does not budge.